Street dog in Varanasi is submitted to the assignment ‘The Tale of Two Wolves’ on Nat Geo. Kristian Bertel has contributed to the National Geographic community with an assignment called ‘The Tale of Two Wolves‘. For this assignment curated by Asher Jay a National Geographic explorer and a creative conservationist she is presenting a theme that aims to conceptually examine wolves through the lens of science and storytelling. Nat Geo encourages people to submit images that innovatively bring the narrative and visual motif of the “wolf” in to focus from a unique cultural, political, ecological, emotional and or conceptual perspective. As Asher is saying it: ”- The poor beast has had a bad reputation for years on end for no fault of its own and needs your help in restoring public faith in it’s true character and context for being. Another way to think of the assignment is as a product placement campaign. If the “wolf” was a brand, how can we replace the existing adverse adjectives, slogans, and analogies to coin a new marketing initiative for the animal? Can you think of the catch phrase? Can you resuscitate its description? How can you rehabilitate the image of the wolf?” she says. How has the “Wolf” been perceived and received by the masses so far? The answer lies within us and we should ask ourselves. Look within. When you think of the word, what associations come up for you? Are they largely positive or negative? If it is the latter, why do you feel negative about wolves? Trace it to your earliest encounter of the “Wolf.” Was it in a bedtime story, in a middle school read or while we were hiking or camping with your family in the wild? What story forms in your head? Is your knowledge of the animal based on science or on folklore and fiction? Urban India has two features which create and sustain street dog populations, where large amounts of exposed animal carcasses, which provide an abundant source of food, and a huge population of slum and street-dwellers whose way of life includes keeping the dogs as free-roaming pets. For instance, Mumbai has over 12 million human residents, of whom over half are slum-dwellers. At least five hundred tons of garbage remain uncollected daily. Therefore, conditions are perfect for supporting a particularly large population of stray dogs. 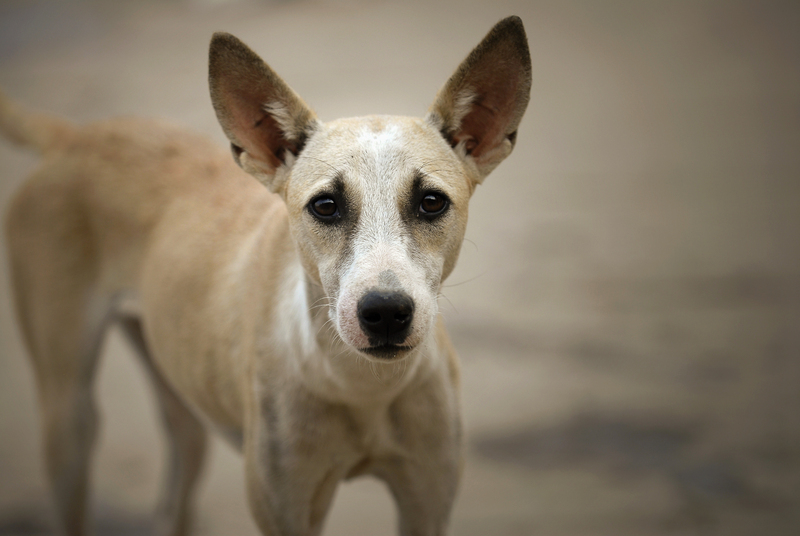 India has the highest number of human rabies deaths in the world. Dogs are known to be a highly adaptive and intelligent species. To survive in modern cities, street dogs must be able to navigate traffic. Dogs and modern day wolves evolved from a common ancestor some 33,000 years ago. Since that time, Dogs and wolves have shared many traits that have linked them throughout the millennia. Thought to have been self-domesticating, dog ancestors found it advantageous to hang around human settlements. In return, humans found that these early dogs made good alarm systems and great hunting partners. Since that time, humans have sought to focus on certain traits within dogs that help them specialize in their duties. However, dog still share much with their wolf ancestors. Wolves and dogs share much of the same genetics, so much so that wolves can be bred to dogs and produce viable offspring which can produce offspring. Wolves and dogs are genetically 98.8 percent identical. Depending on the breed, some dogs share a majority of wolf-like genetic attributes. The reason is largely due to interbreeding and focusing on wolf-like genes as well as breeding in wolves in the past. Because of the genetic similarities, both dogs and wolves share behaviors, physical attributes, social interaction, territorial instincts and forms of communication. ” – In recent years, more and more middle-class Indian families are acquiring dogs, but many prefer foreign pedigree dogs instead of Indian street dogs. Residents routinely complain to their municipal corporations about street dogs in their neighborhoods”, the photographer Kristian Bertel says.